The big carpets are certainly enjoying the warm nights, this one from up on Mt Glorious just out of Brisbane. Cheers thanks Firepac, they are all beautiful but I have always had a fondness for the big old carpets. Watching them quietly moving through the night I'm glad I'm not at sleeping bird or a small mammal. I am not sure if it is because it is so dry but my chookie population isn't being decimated this year. Early in the warmer weather we relocated a couple of big carpets from their intended dinner. We are thinking they must be hanging closer to the dams. Not that I am complaining. Gee that brown sure is a healthy looking fella. Finding a few around Bathurst this summer too. I had a medium sized carpet snake in my shed last Sunday. Chasing rats as I have grain in steel rubbish bins for our geese, ringnecks and budgie etc. He had a lovely lump in his tummy and was quite placid. I just picked him up and put him over the fence into an old run down mango plantation. He will return again as I have plenty of rats and I quite like him and his mates hanging around. Now if I could just hire a scrub python for a couple of weeks to get rid of the bloody possums in my roof I would be more than happy. Wife isn't fussed 1 way or the other with snakes but she does get the irits with the common tree snakes hiding in our hanging self watering pot plants and they stick their heads out when she is filling up the reservoirs. We had an Eastern Brown a couple of years ago and he wasn't welcome and was removed by a local snake catcher. that lump in his tummy wasn't a tennis ball was it?? Does anyone know much about Sea Krates (type of sea snake) .Laticaudids Highly venomous. Found one on the beach and will post pic soon. Amazing they spend up to 50% of their life in the water and 50% on the land and come out of the water to lay eggs. Lol no it was not round but looked like a definite rat shaped. Nice old bloke, very good manners and he didn't play up as I fed him over the fence. I got a nasty nip on the heel of my palm from a carpet snake when I was a kid in PNG. I have had worse bites from a 2 year old rug rat but man it did tickle a bit. Lol. 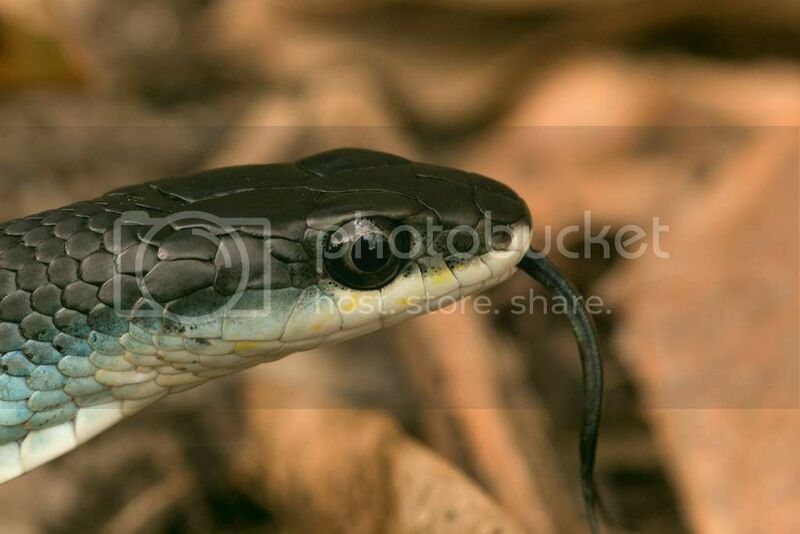 A stunning Blue Phase Common Tree snake. Some may be interested in this article. Been a while since anyone posted in this thread. Here's a couple of pics of a 4.6M Scrub Python that was recently relocated. Nice little specimen on my deck this morning. Must be something in the air today as I have seen 3 different goannas and this little guy. Believe it or not he was over a metre long and quite the gymnast. He was climbing up the wall of the house before that was taken. Last year was pretty mild for snakes for me. This year they are out in force. 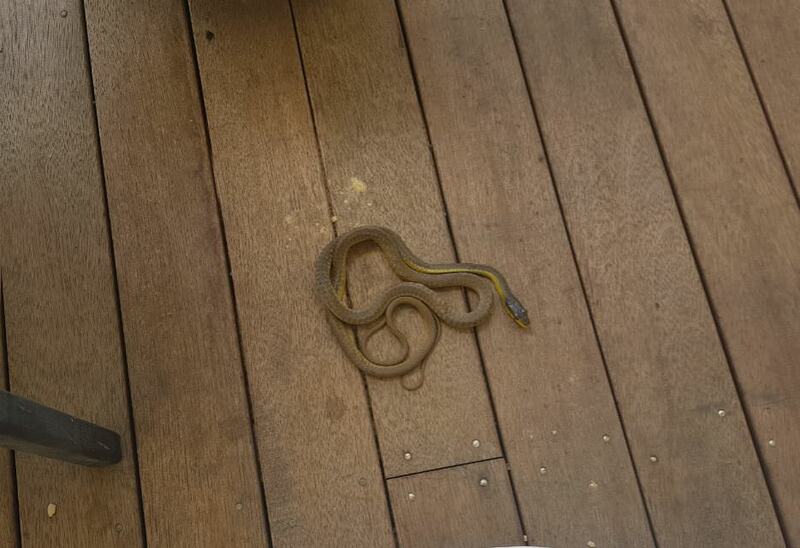 Pretty sure the snake that went onto the veranda at work the other week as I went off was a good sized taipan of about 4 or so feet. I didn't ask him to stop so I could measure him but let him have that side of the house and went the very long way to the clothesline. I am sure that I have had a clutch of carpets hatch. Or maybe 2 or 3 clutches. I have removed a couple from the chook pen, only babies. Went to get a bag from the shed to put one in that was in the house yard last week at night (before the dogs found it) only to notice the rope beside the baling twine was moving. I ignored the little brown tree snake that was making haste to get away from me. Couple of days later the dogs found a very young baby carpet in the yard. I am sure they think they are doing the right thing by killing them but I would rather they didn't. We had new fencing put in and I decided that I should have a solar light put above the houseyard gate. Hubby didn't like the position I wanted it directly above the gate. He wanted it so I could see people outside the gate, I wanted it directly above so I could easily see if there were any snakes on it before opening it at night. "How often is there a snake on the gate?" "I have seen lots on it so want the light above it thank you" "Allright, but I think it is in the wrong spot and you are exaggerating about snakes on the gate"
That same night sons stupid dog is barking. Go and investigate. Yep, Mr Little Brown Tree snake is using the gate to get from one side of the garden to the other. I might have done a bit of rubbing it in on that one. Dogs are all on chains/locked up at night to stop them snake chasing. I prefer to know what they are up to. Same around this area. I see dead ones on the road most days and the day I took that photo we saw another tree snake around the corner from here and had 3 different goannas in the vicinity of the house (all different size) . I am happy to see the goannas here. I am told they keep the browns at bay which I am keen to keep away from my dogs. 6 registered (Barronriver, Sandbank, A sunshower, Multiversity, seaworthy, 1 invisible), 52 Guests and 3 Spiders online. Generated in 0.030 seconds in which 0.008 seconds were spent on a total of 13 queries. Zlib compression disabled.